(CNN) -- Two roads diverged before Jennifer Jackson in this flailing economy: She could restart her career as an electrical engineer or pursue her childhood dream of becoming a hairdresser. 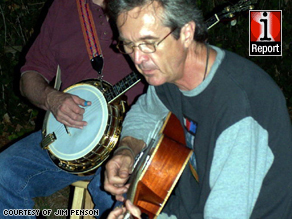 Jim Penson, an avid banjo player, started a business giving music lessons after he lost his job. Jackson, 39, took the road less traveled, opening a hair salon in Chicago, Illinois, last fall. "Jobs aren't out there like they used to be," says Jackson, who has 12 years of engineering experience at corporate giants like Motorola and AT&T. Still, the college-educated professional recently struggled to find an engineering position in the dismal job market. "I decided to get creative and completely shift gears." The economy looks bleak with unemployment climbing to 7.6 percent last month from 7.2 percent, according to the U.S. Department of Labor. Meanwhile, foreclosures mount while benefits, savings and pensions deteriorate. As job security from corporate America fades, Jackson and others see the economic downturn as an unexpected chance to transform hobbies or youthful fantasies, once-dubbed impractical, into grown-up careers. Waldusky, who worked for major labels like Louis Vuitton in the past, tried to find a design job for months when the stock market plunged last fall, but says job opportunities were scarce. She had been designing her own jewelry as a hobby for many years and decided to use her savings to make her jewelry business a full-time gig. Professionals are realizing the prescribed path of a college degree leading to a lucrative job may no longer exist, as the volatile economy takes a toll on some of the soundest professions, such as banking and law. Almost every day Fortune 500 companies announce more layoffs, leaving remaining workers left to fear they may be next. Some small businesses owners say launching a new venture in tough times is better than doing nothing. "It may not be as glamorous or as prestigious as what you had been doing before you lost your job, but it may well save you," says Walter Kerschbaum, a 63-year-old antique clock collector, who opened a shop called Scarsdale Antique Clocks in Hartsdale, New York, two years ago. When a Wall Street financial firm let Kerschbaum go two years ago, finding new work was hard because his age made him less attractive to firms, he says. He decided to make his talent for fixing clocks and his penchant for collecting them into a career. At his cozy store surrounded by the melody of ticking clocks, Kerschbaum happily works seven days a week for an income that is meager but enough for him and his wife to live on. There is no doubt small businesses have been hit hard by the financial crunch. Prospective entrepreneurs have plenty of reason to feel risk averse. Even in a good economy, the most successful businesses need a lot of capital, especially with tight credit markets, experts say. Only 80 percent of businesses survive after the first year and the chances dwindle to 44 percent after four years, according to the Small Business Administration. "It's not the ideal time, but that doesn't mean you can't do it," says Hallie Crawford, a certified career coach based in Atlanta, Georgia. "I think because of the way the economy is that you just have to be a little bit more careful." Some famous businesses were born in an economic slump. Proctor & Gamble Co. began selling household products in Cincinnati, Ohio, during the Panic of 1837. FedEx Corp. started a shipping business out of Memphis International Airport in Tennessee during the oil crisis of 1973. The number of small businesses is increasing in the United States. According to the federal Small Business Administration, the number of nonemployer firms has risen steadily this decade to 21.1 million in 2007, a jump from 16.5 million in 2000. Jim Penson, 55, of Arlington, Texas, went solo after working in the information technology field for mid-size to large companies for decades. The jobs had once provided a comfortable salary for his family, he says. But by 2004, Penson was feeling the pinch from the dot-com bubble burst. He had been laid off several times. He diligently sent out over 800 job resumes but only found rejection. "I was Joe-middle-class-go-to-work-in-a-cubicle-for-20-years," he says. "When all that was stripped away, what was left was my music." That's when Penson, an avid Bluegrass musician, decided to form PensonStringWerks.com, a company that offers banjo and mandolin lessons. Today, he teaches more than 20 students. Going solo is a rockier road with a pay cut, but he says he is getting by doing what he loves. In a bad economy, savvy entrepreneurs can capitalize on low overhead costs, cheaper commercial leases and advertising rates. They can also pick from a larger, more qualified pool of laid-off workers, says David Seaman, an author who writes about personal branding. "It's very scary, but you have to put in big to win big," says Erica Bethe Levin, who started an online city guide for women called CheekyChicago.com last fall after being laid off from a public relations company last year. Jeffrey Cornwall, director of the Center for Entrepreneurship at Belmont University in Tennessee, says small business owners must be fiscally conservative and adapt to changing customer demands. Launching a business during an economic crisis can be a good time to steal market share from established yet vulnerable competitors. One perk to being small: Since small businesses employ less people, enabling the organization to hunker down and reduce expenditures when the economy goes sour, he says. Back in Chicago, Jackson's salon, Asili Chi Salon & Spa, operates full time. Between clients waiting to get their hair trimmed and styled, Jackson says she's happy with the path she chose. "If I couldn't go out there and do something different, then I wasn't living to my full potential," she says.